Thank you – good advice 🙂 Having fun & being myself I have no trouble with. I’ll just skip the form filling part. A primary school reunion would be very interesting. I have FB friends from then but haven’t seen most of them, only a few at a high school reunion in 1986. I’d only been gone 5 years, so it was very same same. I’m a serial avoider as well. There are a few people from my university days I wouldn’t mind seeing again but school? Never in a million years. Good luck and have fun! Thank you 🙂 Despite my lack of motivation I feel lucky to have these women in my life. We have only lost 2, 1 very early and 1 just after the last reunion… so you never know. At each reunion, and at any other functions where some of us are together, it’s like no time has passed, we just take up where we left off. I think it was the form that was offputting, like I was being assessed. I’m ignoring it. Ah that does make a difference. School days were a misery for me so there’s no-one I’d like to stay in contact with. I hope you have a great time. I think it’s cool you are going and still have friends from school. Boarding school would have been a very different experience. I never go – but our high school had 1,000 people in my graduating class – and so many are still into the impress everyone and perfect clothes (but the figures are so much different now…did they notice?). Besides, no one would recognize me as I was pretty invisible and studied so much in high school – college was much more fun. The questionaire was funny: will everyone just pin it to their backs so you can eat and drink and not have to worry about making sparkling conversation? Thank you 🙂 Once I’m there it will be fun. I was just saying to the abovementioned Nanna who is thinking what to do about her own daughter’s schooling, that I loved boarding school. I was homesick at first, which was odd because I was happy but it was the adjustment I think, as I was an only child from a small country town. It was a great transition opportunity and at the end I easily launched into the world. My Dad suggested it because he and my uncle had boarded at the equivalent boys school. I would have liked to go to college or uni but then in my family, it was unheard of, and just sending me to board was a stretch. Along with most of your commenters reunions aren’t me either. I work on the principle that if you want to keep in touch with someone and meet them again you will. Otherwise, move on and out. When I was in Sydney the group in the hostel at Kings Cross where I was living all agreed to meet up in Trafalgar Square for NYE in 2000. What a stupid and totally ridiculous thing to even consider. Did they not think their lives might have changed somewhat over the next 15 years that might prevent them from meeting up with a group of people who paid a fleeting part in their lives for a few months? Had I signed up for it I wouldn’t have been able to go either as I was on call-out in the health service for our millennium emergency planning. As for the form, it would have me tearing out my hair. Someone is obviously a bossy control freak at work. And thinks the highlight of everyone’s life is to get married and have kids. My answers would probably be – high point: travelling around the world, low point: coming to this reunion. I always fancied boarding school though. Read too many chalet school stories in my childhood. Yes, it probably wouldn’t be me either except for this group. I have been invited to other reunions, centenaries and to be Facebook friends etc but I’m selective… actually no, I went to one 5 years after I left my old high school and it was crap… no-one had been anywhere or done anything. I was happy to the Tamworth reunion, obviously seeing as I booked my flight 10 months ago, up until I thought about it eating up my entire weekend. I’m thinking you’re right about the form creator but I’m sure she meant well. I enjoyed my 2 years but I’m glad I didn’t do the 6 some of the others did. I’ve been left school fortyeight years this summer. I’m not sure if there has ever been a reunion, but even if there has/is there is no way anyone would persuade me to go to it. Too much water under the bridge, and my school days are a hazy past, so I’d have nothing to talk about. I don’t understand the idea of the [quite intrusive] questionnaire, surely if you want to attend a reunion, the idea is to chat face to face, not know all the answers before attending. As for hair, clothes etc. I wonder how many are going to become something they aren’t, just for appearances sake. Be yourself [you come across as a very easy going relaxed sort of person] and enjoy the catch up. I wouldn’t go to a reunion if it was after so long either! Just not worth the bother, and exactly, very little commonality. I said similar to the G.O. – I wondered how much time-money will be spent on facials etc and special hair & outfits. I haven’t done anything spectacular, just what I would normally, as you say I’m fairly relaxed, sometimes more so, but there was a niggle there to present my best without being ridiculous about it! Thank you 🙂 Now it’s almost the weekend and I’m organised, ready to go, I’m looking forward to it. 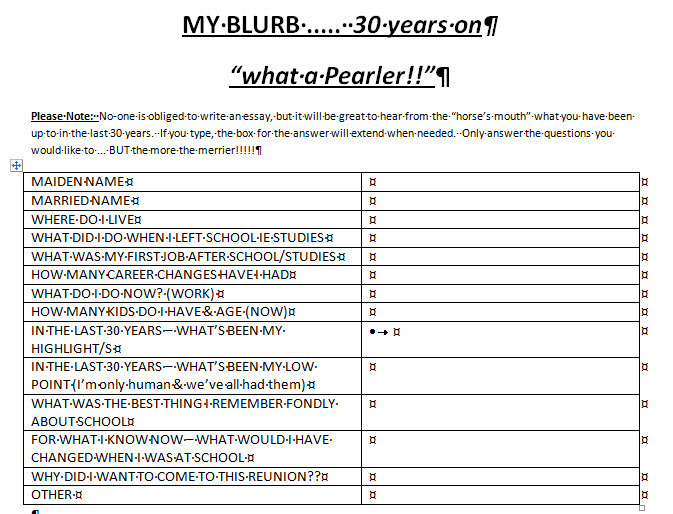 I think if I’d had little or no contact with my classmates for 30 years, I wouldn’t be interested either. Even with Facebook blast-from-the-past-friend requests, I only accept those I was really friends with, not just classmates. My school had a reunion recently and I elected not to go, I haven’t seen those people for over 30 years, and I really hope I am not the same person i was back them. I think you are very brave and think you are amazing. I with Meeks. School was a misery, best left behind! There is no one there I want to see again. I am pleased to read that you enjoyed it enough to want to see them again though. I expect that the life you have in boarding school is very different from the one at a day school. Looking forward to your “after the reunion” post now! Isn’t the point of the reunion to catch up? If you’re filling out this form, why do you have to show up. They can just read the blurb and pretend they know what you’ve done in the past 30 years. 😉 I’m with you skip it all and wing other. 😉 Hope you have a great time! I did 🙂 I’m not sure how popular reunions are anywhere. Out of all the comments only one has been to a single reunion. Even my cab driver in Tamworth today said re his class at a different school “we were supposed have a 30th reunion last year but it just didn’t happen…” For people who live where they went to school it’s irrelevant, and for the ones who moved away… it can be hard to go back. How big of a class did you graduate with? I’ve never heard of a reunion sending out a questionnaire for the alumni, but maybe it’s because I graduated with six hundred in my class. Not sure if you’re off to the reunion yet, but have a great time. Maybe you can share about it when you return.